Power transformers are widely used in a power system to transform voltage. The most common type, a two winding transformer, has one winding connected to a high voltage – low current circuit while the other winding is connected to a low voltage – high current circuit. Transformers rely on Faraday’s induction principle and ampere-turns to induce voltage from primary winding to the secondary. The transformer’s core is made of laminated sheets of metal. It is constructed either as a shell type or a core type. See figure 1. With the ubiquitous application of three phase power, these cores are then wound and connected using conductors to form three 1-phase or one 3-phase transformer. Three 1-phase transformers have each bank isolated from the other and thereby offer continuity of service when one bank fails. A single 3-phase transformer, whether core or shell type, will not operate even with one bank out of service. This 3-phase transformer however is cheaper to manufacture, has a smaller footprint, and operates relatively with higher efficiency. Figure 1: Forms of Construction. 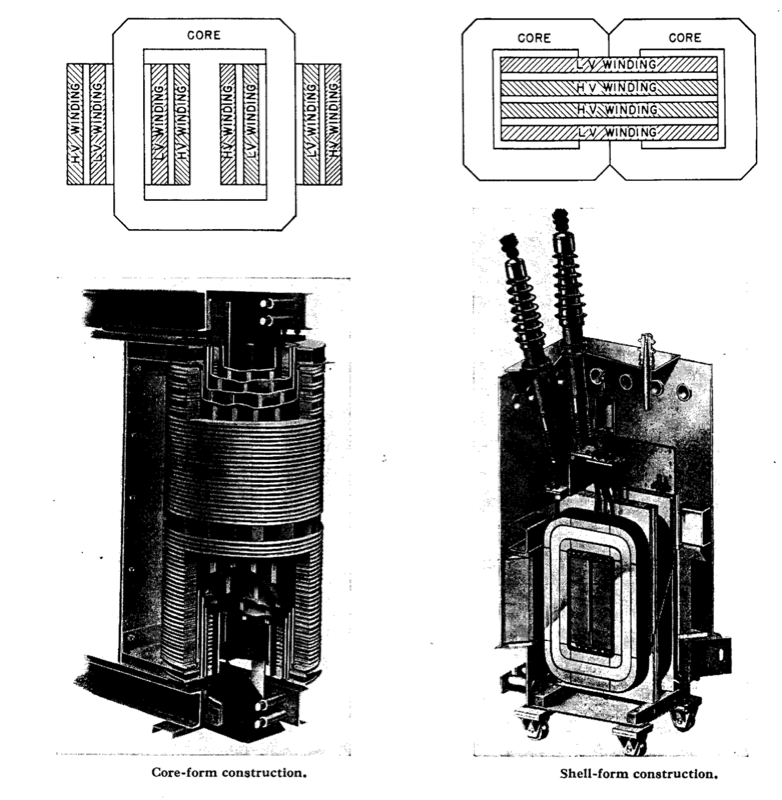 Image Courtesy – Electric T&D Reference Book by Westinghouse Engineers. The transformer’s core with its windings is immersed in an fire retardant insulating oil inside a tank. The conservator on top of the tank allows for the expanding oil to spill into it. The load tap changer on the side of the tank changes the number of turns on the high voltage-low current winding for better voltage regulation. The bushings on top of the tank allow for conductors to safely enter and exit the tank without energizing the outer shell. The transformers power capability is limited by thermal rating. This means the transformer can be operated beyond its MVA rating as long as the temperature of its top oil stays within the 65ºC temperature rise above ambient temperature (See IEEE C57.91-1995 standard). For instance, if the ambient temperature is 45ºC then the transformer can be pushed to a value less than 45ºC + 65ºC = 110ºC. Since temperature is usually the limitation, the radiators on the transformer are fitted with fans so they can force cool the oil flowing through the radiator fins. Prolonged overloading of the transformer is not recommended on account of saturating it’s core (higher losses), loss of life expectancy, and deterioration of winding insulation. In a three phase core type transformer, for each phase, the primary winding and the secondary winding are wound on the same leg. The windings are ofcourse insulated from each other. The low voltage secondary winding is typically on the inside while the high voltage winding is on the outside. This is done to minimize the leakage flux during the whole induction process. To enable the conduction of currents, the windings are wound and connected either as a delta or a star. These shapes form as a result of the way the three conductors inside the transformer get connected. See figure 2. The use of these connections delta-star, star-delta, star-star, or delta-delta make a huge impact on the design of power system. So the choice of connection is critical. Without going into a lot of detail, for cost savings and safety, the star connection is the preferred connection for high voltage transmission. In this scenario, the common point in the star, also called the neutral, is grounded or earthed. Doing this causes the phase to neutral voltage or phase to earth voltage to be reduced by a factor of 1/sqrt(3). You will not get this reduction with a delta or any ungrounded connection. It only makes sense to use a delta-star transformer near the generating station where the delta is connected to the generator terminals and the star is connected to the high voltage transmission lines. With grounded star connection on the high voltage side, the transformer winding can be insulated for lower voltages. The transmission system too will have a lower insulation requirement. These provide for huge cost savings in the design and construction of a high voltage power system. There is, however, a disadvantage in grounding the transformer. 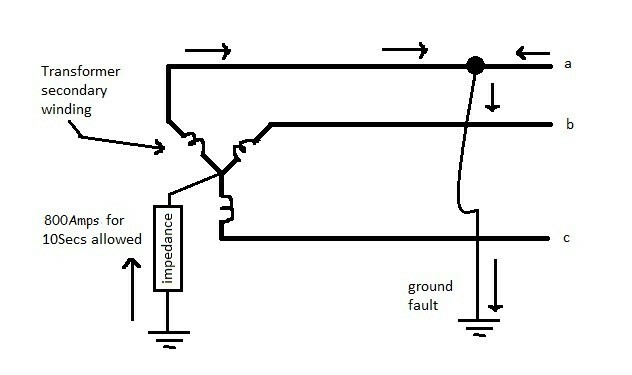 When one of the lines or all three lines on the star side gets short-circuited to the ground, the grounded neutral in the transformer serves as a return path for the current. These currents are pretty high in magnitude and if not cleared in fractions of a second, it can severely damage the transformer and all the equipment connected to it. These ground fault currents are also rich in third harmonic currents. Third harmonics disrupt telecommunication network which, by the way, is used to implement pilot relaying in a power system. But all is not lost with grounding the transformer. The delta connection on the primary winding helps here. It offers high impedance to third harmonics and traps the ground fault current in the delta thereby isolating the ground faults to the secondary system. Now, you would think the delta-star configuration of the transformer is pretty awesome and that it is installed everywhere in the system. However, it is not. 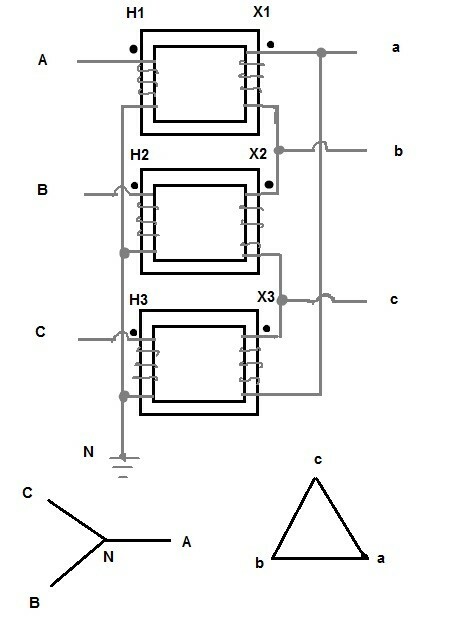 To retain the advantage of a star connected system, few bulk power stations have a star-star connected three winding transformer, the third winding being a delta tertiary. With this three winding transformer, the primary star connection keeps the primary system solidly grounded while the grounded secondary star connection extends the cost savings into the secondary system. Delta-star transformers : Useful at generation and load centers. Star-star-delta transformers : Useful at transmission substations (765kV, 500kV, 345kV). Grounding the neutral provides higher ground fault currents however the cost savings realized by lower insulation requirements makes grounding viable. A hydro plant I was at had three transformers (A,B,C) for a pair of 35 megawatt units. They were each a Wye winding transformer only. I was figuring a bus work configuration made up the delta winding. A newer section of the plant had a single transformer for a pair of units and it was a delta,wye transformer. @ Bob. Umm….what are you suggesting? You cannot connect phases together in “bus work”…that is essentially short circuiting the system. Can a delta winding be made in a plants bus work and then a Wye transformer only be needed? pls send the application of power transformer. You use star-delta (the secondary system ungrounded) to prevent high fault currents flowing into the system. Unlike Delta-star, there is no return path for the currents. Ungrounded systems are typically used where continuity of service is important. Industrial systems like paper mills, therefore, employ this distribution system to keep their machines running. Ungrounded systems are not widely used. Its list of problems (mainly safety) over-weigh its advantages. Please, i wanna know why do we have to connect star-delta transformer, i mean whats is the purpose? or why star delta not delat star at some point? would you please guide me how REACTOR RESISTANCE protect tertiary winding of power transformer against third harmonic density in 3 winding power transformer. Low-magnitude turn-to-turn faults are usually detected by the sudden pressure relays (SPR) inside the transformer tank. They are more sensitive than a transformer differential protection scheme. i am confused between connections of transformer windings and transformer connections with the main supply. can you please tell me that the delta-star, delta-zigzag, delta-delta are connections of transformer windings or the star transformer connection with the main in delta configuration? why we use neutral or star connetion at secondary side of POWER TRANSFORMER while at 33/11kv substation 3 phase incoming and 3 phase outgoings are required? Hello there. Can you explain a little bit about “sensitive turn to turn fault protection for power transformer” with a negative sequence. Required information, can a power transformer winding connections changes does not impect on its working. We intend to change the connections of a power transformer from YDN to DYN i.e. primarry side star connection to be changed to delta and secondary side to be changed from delta to star + neutral earthing. (our primary voltages are 11,000volts and secondary 400volts. In three winding transformer with stat-stat-deltal vector group, In delta side reactor is provided but reactor ground is not earther (Earth floating). Now, what is difference between grounded reactor and un grounded reactor. Please explain and what are factors influence? Lately, all CT’s are wye connected on either side of the transformer bushing. This is because the modern microprocessor relays can compensate for the phase shift using their logic. However, when presented with old electromechanical relays, the CTs on delta side of xfmr should be wye connected while the CTs on wye side should be delta connected. This is an interesting topic. I will work on writing an article on this in future. In most scenarios, I have seen CTs on breakers (on either side of the transformer) provide the differential function. The only CTs I see on a transformer are located in the neutral winding. How to connect CT on each connection of a transformer? Use diagrams please. Breaker and a half scheme: When continuity of power supply is critical, you need to have a bus configuration that is flexible enough to reroute the power when feed from one side is down. Breaker and a half, provides this flexibility. Each bay has three breakers with two line tapped from a location between the breakers. The center breaker serves both the lines, hence breaker and a half. Ofcourse, this elaborate system is expensive. one more question i have is how delta connection in primary prevents in reducing the fault current and harmonics in star connected secondary????? SUPER LIKE…………..THE ARTICAL WAS REALLY HELPFUL.BUT I HAVE A QUESTION THAT CAN U EXPLAIN ABOUT THE ONE AND HALF BAY SCHEME. 1- Advantage – Fewer resistive (heat) losses. Power can be delivered over vast distances. Not sure what you intend by an example. If you are looking for a mathematical proof then use equations P=VI and Heat loss = I(^2)*R (Joules law) to make your point. 2- DC voltage cannot be transformed easily unlike the AC voltage. AC quantity is time varying and therefore relies on Faradays induction principle to step up or step down voltage. DC quantity cannot induce voltage on its own unless it is wound on something that rotates. 2-explain why the requirement for changing voltages throughout the system means that A.C. must be used. Domestic electrical supply in the U.K. is at approx 240 volts A.C. 50 Hz. Whilst transmission voltages through the grid are much higher, of the order of hundreds of thousands of volts. Explain, using an example, the advantage of using high voltage for transmission and also explain why the requirement for changing voltages throughout the system means that A.C. must be used. I was recommending the use of star connection on the high voltage side for the step-up transformers, near the generating stations. For the reasons you have indicated, I do concur on using a star connection on the low voltage side for the step down transformers. Please correct. Normally star is used on the LV side and Delta on the MV or HV side. The reasons are simple, the star connection gives two voltages, for stability the star point can be earthed, a fault current can flow through the earth loop which trips the protective device etc.. To transmit at LV and MV to distances you only need 3 wires. Happy to help you, Antony. Great article. Very useful for my exam preparation.